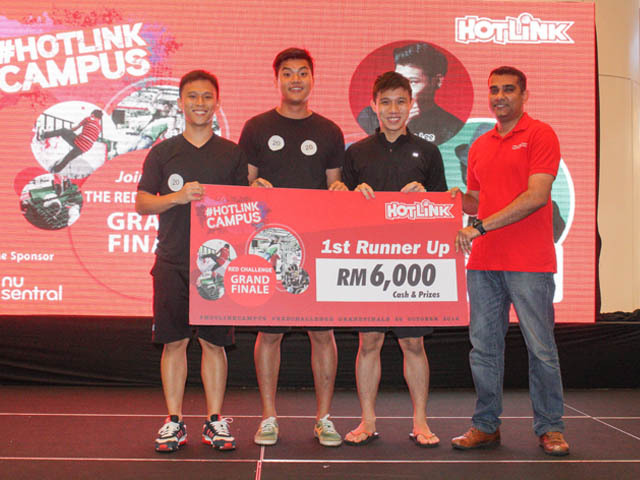 Two teams each comprising three students who named themselves Team ‘Look at Me Now’ and Team ‘I Love Hotlink’ bagged the Grand Prize and first runner-up respectively in ‘The Hotlink Campus Red Challenge Grand Finale’ held in NU Sentral Mall, Kuala Lumpur on 26 October 2014. ‘The Hotlink Campus Red Challenge Grand Finale’ organised by HotlinkCampus is a series of fun and enthralling physical obstacles run embedded with games and battles which were particularly organised for Institute of Higher Learning students. With participants from 11 universities in Malaysia, the finalists were required to complete a total of eight fun-filled challenges, namely, Flipping FAAST, STAY WITH RED, THE SOCIAL MONKEY, FAAST OR FREE, WHAT’S THAT BEAT, ALWAYS ON, among others as quick as possible. The winners will be evaluated based on the speed one’s took to complete the overall challenge. The team ‘Look at Me Now’, comprising Finance student Lee Sze Yi and two Construction Management students Chee Shun Han and Lim Chee Fong was announced as grand prize winner. They won three units of LTE Smartphone worth RM4,000, RM 6,000 in cash and as well as RM15,000 in the form of university event sponsorships. The other team comprising undergraduate students from UTAR Faculty of Arts and Social Science; namely, Low Jey Ming, Tan Zhong Xian and Chong Liang Wei was emerged as first runner-up and walked away with prizes worth RM6,000 including three units of LTE Smartphone. “We felt very proud and happy to be given the opportunity to represent UTAR to the Grand Finale of the Hotlink Campus Red Challenge to compete with 10 other universities all around Malaysia. We are so contented, proud and satisfied that we have secured the top prize in this challenge and we are happy to make the University proud. Last but not least, we had loads of fun during the whole process of this competition and through the competition; we learned the importance of teamwork and cooperation as well as strategic planning,” said the champion team. Both UTAR teams expressed their appreciation to HotlinkCampus for organising such an amazing activity for students.